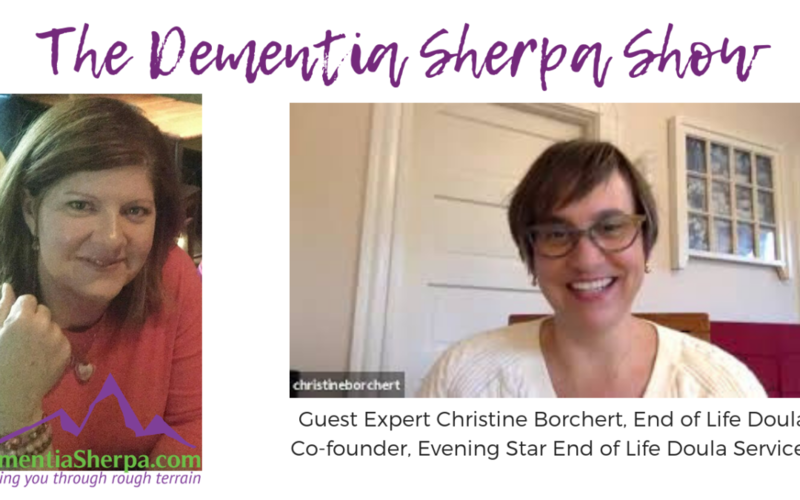 Dementia Sherpa - What's an End of Life Doula, and What Do They Do? Christy Turner: This is somebody who has a rather unique profession and I think you’re going to find so much benefit out of what Christine has to say. I think the work that she does is so important and, again, really unique. I’m going to let her explain what she does, but I will say right now she is an end of life doula. That may be something you haven’t heard of before, but she’s going to explain what it is she does and why it’s so important that you know what this is and how it can really impact quality of life at the end of your loved one’s life. 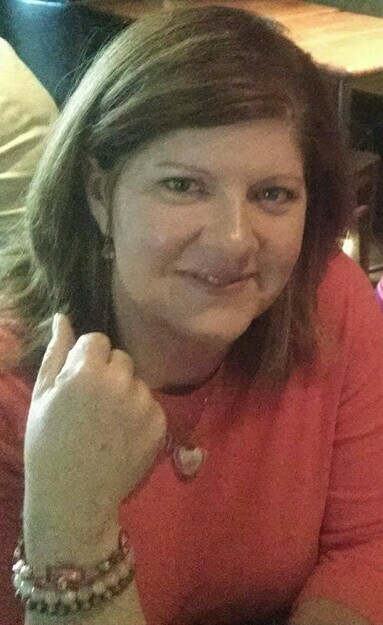 Christine Borchert: Thanks, thank you for having me, Christy. It’s exciting to get to share with folks what end of life doulas are and what we do. I work with a team of three partners in our business, which is Evening Star End of Life Doula Services. We have all been trained in how to educate, coach, and help with planning around end-of-life topics. 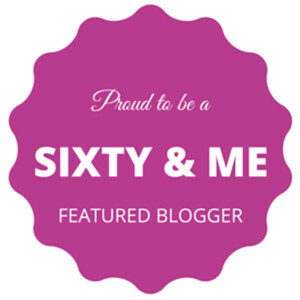 It’s a huge variety of things that we do, which would take me 15 minutes to list! When I think about what we do and what’s special about it, is that we offer deep active listening to the person who’s dying and also to their family members. It’s a safe space for people to really sort of process what this loss is going to mean, and we sort of bring to the conversation zero of our own belief systems. You know, it’s really just about being super present for the person who is facing a loss, whether it’s their own death or the death of a loved one. Christy: I’m glad you mentioned that because I imagine probably the people that I attract into my tribe have a similar value system and belief system that I do. Of course, we’re not all the same but I’m imagining there are at least a couple of people because I’m not a unique–but a combination of a Capricorn, plus I love a lot of woo-woo–so there’s probably somebody like me who is very practical on a day-to-day basis but also believes there’s so much more than what we see here in the physical world. So I’m wondering–because our tribe here in Dementia Sherpa are family care partners, for the most part, though there are professionals, also–what you’re talking about: being present and mindful and creating safe and sacred space. Probably somebody’s wondering, Well, how does that work if my person has dementia? What’s that all about? Do you want to speak to that? Christine: Yeah, absolutely. One of the things that we know is that people can be engaged at a lot of different levels. Folks involved with dementia know that people have all different degrees of where they’re at in their process, and so it might seem like a person would only come to us when they knew dementia was starting. But really, I believe deeply that we can work with people all the way through. And one of the things that we do that really helps families begin to find a little bit of peace in this process is we do something called legacy work. Legacy work is a project. It can be a book, it can be a recipe book. It could be a photo album; it could be audio. It could be songs; it could be a garden. Anything that the person who’s dying was deeply involved in and deeply loved. We sort of base the Legacy Project around that theme and people stay engaged in their muscle memory with those things they loved the most. And we would do everything we could to facilitate their involvement with the family and the loved ones in creating this project. What’s beautiful about that is I think it’s challenging sometimes to switch from being focused on symptoms, pain management, you know. All the nuts and bolts of keeping a person safe and well cared for becomes a lot of tasks and what we really like to do is help people remember this person’s lived experience. And if we can have conversations together with the family, with the person being involved, develop this project…there starts to be this beautiful storytelling and remembering and discovery because we’re having conversations that really leads to an enriched and actually sort of healing component at end of life. I think a lot of people don’t realize they can access that. Christy: Yes. My heritage is Irish and Scottish, so what you’re describing sounds like a less rowdy wake, where we’re telling the stories and really honoring the person and talking about what’s meaningful for the person who is at the end of her life. As a professional, I’ve probably attended, I don’t know, somewhere around maybe a hundred funerals. I’m not denigrating any particular faith tradition, however, I have been to a lot of Catholic funerals, which I do not like. Likewise, some other just really traditional religious funerals, and the reason I don’t like them is because it to me sounds like a sermon. It is a religious service, and then tacked on to the end of it is, “Oh yeah, by the way, Christine was born here and died here but now she’s in a better place.” Like the person is kind of tacked on at the end of the religious service. I did have a co-worker say to me one time when I finally expressed it (and she was Catholic), and she said, “Oh, you should go to the rosary! That’s where we really talk about the person.” But this, this sounds like in being an end of life doula, you’re really able to make sure that that particular unique human being is honored and remembered in this process. Christine: Yes, absolutely. Christy, it’s interesting because it’s super important for the person who’s dying and it’s incredibly important for the people who are left behind. Often when we’re approaching end-of-life, there’s not a lot of conversation happening unless you have a really robust, you know, developed, communicative family. If you don’t love that, there can often be not a lot of conversation happening because people are worried about making someone feel sad. They’re not sure if it’s okay to say or ask these things, and we sort of go into this protective mode and then that conversation isn’t happening. And in the sadness around that, that means that that person who’s dying doesn’t have a chance to be really honest and share what’s really happening for them and they then have a higher likelihood of having more anxiety when they’re in that active dying phase. [They] did not have a chance to do that deep communication and conversation that they could have done, that would have allowed for them to have lowered anxiety, because they would have expressed themselves to the people they loved and it would allow the family to benefit from that as well. The flip side of that is when you actually work on a legacy project, you know this conversation happening. So the conversation across the board– anybody who can be having conversation about end of life–is like, “Woo-hoo! Bonus! Amazing! Good job!” The challenge is when none of that is happening, and then your person is dead. Unless they have left something for you to interact with it, it’s really difficult to have a deepening and growing relationship with them. For example, my dad wrote his life story. He died 10 years ago, and you know, when he was writing it, it was very important to him. And I just thought, you know, Whatever, awesome. Great. Great job, Dad. But now that he’s dead, I pull that out every two years or so and I read it, and what I love–and this is why this legacy concept has become so crystal clear to me–what I love is that while his words have not changed, who I am has changed. And so every time I read his story, I learn something new about him because I’m different. I’m able to hear what he wrote differently. However a person chooses to leave their legacy project, whatever format that is, their people who loved them will be able to have a continued, deepening relationship with them that changes over time. But they wouldn’t get that if they don’t have something to work with. Christy: Okay, I get the concept. I like it. Now, how does that work for a person who’s living with dementia, and they’re at the end of their life? How are they telling this story? What does that look like, as far as end of life doula work in that type of situation? I had the privilege of recording an interview with Christine a couple of weeks ago and obviously she’s an expert at end of life, and I’ve had the privilege of being with several people as they passed, so it’s a topic I’m very passionate about. I totally geeked out, messed up the technology I was using, and deleted our conversation. So for us, this is a continuation of the conversation, but probably we should back up and cover: What’s an end of life doula? Let’s start there, and then circle back around to my other question. What is that, just to be clear? There’s a difference between somebody like me, who may be present at the time of someone’s death. There’s an end of life doula, which is what you are. And people have probably heard of hospice. We’re all three different things, so please shed some light on that. What is an end of life doula? Christine: You bet. An end of life doula is a person who is trained to educate, to coach, and to assist with planning for a person who is approaching end-of-life. We are a hundred percent non-medical. We are not social workers, we are not nurses, we are not chaplains. We are people trained in deep active listening who care deeply about a person having the right to choose an end-of-life that reflects who they are. Christy: Oh, I love that! Christy: Yeah, yeah. So again, now coming back to dementia: How do you work with a dying person with dementia? What does that look like? Christy: It’s not an interrogation. Christine: That’s so intimidating that a lot of times people don’t even want to engage with that. And I would say one of the things we’re really skilled at is helping people kind of find that gentle kind of ‘around the corner’ approach to allowing people to share, so that they can be processing, reliving their lived experience, which lowers their anxiety if we can get it recorded. You know that’s way better, in whatever format works for the family. So, I would encourage anybody who was interested in this to reach out to us right away and we will creatively work with you and the family to put together what we can. If somebody were really, you know, really at the end and not able to communicate–which again, with a terminal diagnosis, you know those last two weeks, which is a period when people are often calling, you know, starting to look for help–people with two weeks left to live are really not able to be that engaged. Either their emotional bandwidth is toast, or pain medication, and so I would say that we would do what we can. We could do things like some plaster casting, maybe have hands. We could do some photography. I think photography would be a really beautiful way to capture some of that essence and love in a family. Christy: I’m gonna dial down on that one because I think you know out of all the people in the world, there are some people that are comfortable with older adults and then out of that pool, not so many people that are comfortable with people living with dementia. And not many people in that pool that are comfortable with dying people, people at the end of their life. Different breed of cat. I’m in that breed, and you’re in that breed for sure, but even for me, with family roots in the South, where people often do pictures in an open casket, I’m out. I don’t particularly see the value in that. And it may be my belief system, where I don’t think that the soul is still there at that time after death. So not to go way, way afield here, but to me it seems just a little bit, I don’t know if morbid the word, but odd to take pictures of a body. Christine: You’re talking about after the death. I’m talking about before and it could be like–I could imagine the family and the person who’s ill, or you know, not as much with us anymore at the table, working on a project. And I do know photographers who are very, very, very, very interested in and passionate in capturing those sweet moments for families. They’re not like straight on, you know, let’s get a traditional photo. They’re like maybe over there, from the back. With the kids, kind of together, the hands working on a project together. You know, those kind of things. That’s beautiful. Christy: Yeah, thank you. I’m such a visual person, I was thinking person literally on their deathbed, maybe 72 hours, you know, before they pass and like, Hey, photoshoot! Christine: If I can just say, my last client? They had a dog and two cats that were part of the family, for sure. And those animals were on their mother’s bed as she was dying, off and on, hanging out, curled up sleeping, and she took, herself, some really beautiful photos of her holding her mother’s hand. Her daughter, who was eight, had painted her grandma’s toenails. You know, photos of the cat curled up between the legs, and the painted toenails. I mean, there’s so many incredibly poignant and sweet and beautiful photos that a good photographer can capture. That’s so comforting. Christy: Yeah, this is so important, that you brought it up, and I’m so glad that you did, Christine. Because I think it really illustrates how important it is to have a skilled professional such as yourself who sees the possibilities and the beauty there, versus you know, kind of what my limited imagination was. I was thinking like, in your face, kind of paparazzi, which just seems inappropriate. But what you’re describing just truly sounds so beautiful in capturing the essence of the relationships and how important it is. So thank you so much for explaining that and for using that particular thing as an example of the type of work that you can facilitate. That’s huge. Christine: Absolutely. It goes back to what resonates with people. Some people might be really creative, creators, and they want to create something and there’s a way that the person with dementia could still contribute, whether it’s painting, or–I mean, people are so diverse and amazing. It’s really our job to kind of suss out in the initial ‘getting to know you’ period: Who is this person? What is most important to this person? Can they start sharing what their life meant to them? And in that process, we can begin to get a picture of who they were, and what was important to them. And we can begin sort of moving in the direction of creating that legacy in a way that involves whoever wants to be involved. And I truly believe that it can be done at any point up until the day of the of the dying. Honestly, if you’re two days out, you can still do it, and you do it by engaging with the folks that are coming around the bedside. You can have them write down a memory. You can have them write down things that this person always said to them, that they heard over and over, and you collect this book of wisdom. Or this book of jokes, if they were a joke teller. Do you see what I mean? Our job here is to capture the essence of this person with whatever we have at hand. That’s really it. It’s important to us because anything we do in that area leaves something for the family afterwards, something that’s not just bills and all the medication sitting on the counter. Christy: I think what you’re really conveying here is how important this experience of having a good death is. Obviously. Not only to the dying person, but the family. For the family, a positive experience. So as an end of life doula, you’re providing that support also for the family. Christine: Yes, I would say it’s almost as much, if not more for the family. Christy: That resonates because it seems to me–I’ve had the privilege of being with 23 people as they passed and as they are there in the last, say, 36 hours or so particularly, there’s so much internal work. It may be longer than 36 hours, but definitely that last stretch where it seems the person has truly turned inward. The outside world is not any great shakes. Communicating with others who have already passed. They’re kind of doing–and I don’t mean this to sound like everybody dies alone, but they’re doing more independent work. No matter what the cause or the underlying condition was that is leading to the end of their life. Meaning, even people living with dementia. I have seen this, and they have lost verbal ability well before this, and now it comes to this and they will verbalize and they are reaching out and there they are. They’re doing what they need to do, is what it seems to me. Whereas, the family could use more support. Christine: Yeah, and we can come in at any time. There’s never a wrong time to call us. One of the things too that I care deeply about is altering this sort of cultural belief that as soon as the person dies, the body’s got to go. I think it’s so important that we allow the families to just pause there, you know? What we say often when we’re doing presentations is, “You know, death isn’t an emergency.” There’s nothing about a body that is dangerous or gonna harm us. There is no law that says they’ve got to be out in X amount of hours. I mean, you could take some hours of just letting your loved one be. Christy: Depends on if they’re in long-term care. There actually are some timelines there. But at home, yeah, okay. Christine: Okay. There’s still a lot more time than people think there is. We recently had a client in Corvallis, we only worked with this person for about five hours total. We didn’t really work with the person who was dying; we worked with the wife. She was incredibly protective of him, and the fact that she reached out to us, even, was pretty incredible. But a few of the things that happened as a result of working with us made me feel like, Okay, we made a little change in their family and their family’s understanding of end-of-life. And one of the things I learned was that after her husband died, she climbed in bed and just laid there for eight hours with him, and I thought what if she had not known [that you can do that]? You know, someone had to tell her that she could take that time. Maybe somebody else would have told her that as well, but we certainly did. And that transition–to your person being dead–is tremendous, and people need to take the time to allow themselves, you know, mentally, spiritually, physically to sort of absorb that fact. So many people have problems around having someone who died because they didn’t get to see them, and I think being able to see your person is super important. If that means, if they’re at a place where they can’t keep the body, you know, that’s some limitations, but if they’re at home and there’s somebody flying in from across the country, you don’t have to be in a hurry to get the body picked up. You bathe it, you make the room beautiful, you have a chair there so people can sit and visit and talk–or lay on the bed next to them if they’re in a bigger bed–until everybody who wants to see them and is trying to get there, gets there. Christy: So you said several very important things right there. One of the first things you said that really perked up my ears: you used the word “labor.” And I think that’s so important because labor being work. It is work to die. It takes an enormous amount of energy, in much the same way it takes a lot of work, an enormous amount of energy, to birth a baby. People may have heard of birth doulas–usually just called doulas–and are more familiar with doulas and midwives, and kind of the emotional support role of a birth doula. You’re an end of life doula and I think being able to pair those two things together helps people have an idea of the kind of the full circle of life. And I think we understand that a birth doula really makes for a much better experience because birthing is hard work, and likewise dying–it takes an enormous amount of energy. So anybody who can support that, a profession that can support that, is so important and I’m really glad that you use that word, labor. Christine: It is absolutely a labor, the soul trying to leave the body. I don’t want to sort of paint this picture that if you work with an end of life doula, everybody has, you know, a desk with flowers and birds singing. I–we–get it done when it doesn’t turn out, always happen–that when you write a plan and things can need to shift. One of our main roles is sort of like helping the family understand what’s happening, this shift is happening. Yes, maybe this wasn’t first choice but it’s okay to do what you need to do to take care. You know, helping people see that it’s okay for things to shift, acknowledging it’s not always gonna be pretty and easy. And just them knowing they’ve got someone in the room that knows their loved one, has a sense of who they are, has a sense of what this person wants. It’s a huge relief. Christy: I think that’s so important. A lot of times people don’t know what to expect, so being able to convey that information is so helpful. Things don’t always go as we planned, and I think intellectually, we know that reality gets a little iffy sometimes. Another thing is talking about having a plan. Just as a mom-to-be can write a birth, there is a vigil plan. Would you like to explain more about what that is and why that’s important? Christine: You bet. A vigil plan is a document that we create with the person who’s dying. If they need help, we’ll have somebody who loves them dearly help develop it. A plan is important because when a person is nearing the end of their life, it’s a very scary out-of-control proposition. Like, what’s most important to us? Do we want our pets on our bed? When you create this list, this vigil plan, and you leave it out for anyone who’s visiting–and this is really sort of once you’re actively dying and you can’t speak for yourself–this is a guide for those who love you and for those who are caring for you. Christy: I love that, a hundred percent love that, because as I was visualizing, thinking what would be important to me, it is so important for people who come into that room to have that moment of pause to get their mind set where it needs to be. To be bringing what I call “the Good Stuff: respect, kindness, love, empathy, and compassion.” To be the embodiment of that, and sharing that energy. When you walk into that room, man, sometimes people are feeling so nervous and like, What should I say? What should I do? and, Should I touch this? and, What if I–oh, my gosh, I touched the bed! Is something bad going to happen? You know, people can just be really nervous because they’re not sure what to expect or what they should do, and it seems like that’s another great purpose to a vigil plan, is so that visitors will know it gives them some guidelines. And can help them feel more confident, like they’re able to be supportive rather than, Should I even come? I won’t know what to do. Christine: That space around the death bed is so sacred and we don’t always do a good job of holding that sacred space. And I think particularly for a family where there might be sort of some some rifts or different beliefs, or, you know, different factions–we don’t know anything about that, right? All families aren’t perfect. Christy: In my experience too a lot of times family members are so emotionally overwrought, and–I know, ‘overwrought’ sounds pejorative, and that’s not what I mean, but just highly emotional–so exhausted, sleep-deprived, stressed-out, anxious, sad, grieving, all of that, and it’s just like this just giant bucket of emotions that comes down, pressing down on them. Christy: Sometimes they do need that little tap, that little reminder of number one, “I see Who You Really Are, and I know that’s not how you’re presenting right now.” And also, “I see you, I got you,” you know? Christine: Yeah. What I love is that once we have sort of the sacred space established, what we can then do, knowing that people understand how to be in there and how to be, is we can then leave that room. We don’t have to be in that room, when things are going all right. We can go out into the living room, to the person who’s out there distressed and doesn’t know what to do with themselves, and be a support to them, as well. And having a team of four, if it was a situation where we realized one of us wasn’t enough, we could call in a second person. So just having that deeper amount of support not only for the dying but for the loved ones, I think is huge. It’s huge and I’m so passionate about doing this work. I’ve been through three deaths, personal deaths, and each one of them left me with a regret and I held on to those regrets for a long time, until I started doing this work and realized my regrets were unfounded. I just needed somebody to talk to about them, and I didn’t have that. And one of the things that we do is after the death, four to six weeks or so, we have a coming together again. If anyone who wants to meet with us, with any of the details that were present, and we just really give people an opportunity to sort of unpack their experience. Talk about what they noticed, if there was something that just is kind of bothering them that they want to talk about. I would have benefited from that that opportunity. You know, it’s an opportunity for us to point out what we noticed them doing well, where we saw compassion, and where we saw love with such generosity. So that their experience around the death of their loved one can be put, if it needs to be, reframed. Be a little bit reframed or put into perspective of what’s normal. Christy: That is so hugely important! People can’t know what they don’t know. Even in the case of dementia, where it may be an expected death. We see that the condition is progressing, and this is the natural way of things, but it is still shocking at the time that death actually does happen, because of all of those days that came before it that it didn’t happen. That’s something that people are often surprised by. Another thing is, just to me, as soon as you said it, I was like, That’s worth it, right there! To have that opportunity four to six weeks later to unpack that, process it, reframe as needed. Because I think what families often don’t expect and are completely shocked by is that they are in a state of shock. As it’s all happening, it’s just emotional overwhelm. And other people start asking questions, and calls, and Who do I notify? And you know there’s always one person in the family that does something odd or inappropriate, so there’s just, like, a whole bunch of stuff going on and your brain almost like takes a little siesta. It’s like, Peace out, I’m doing this to protect you. And so sometimes we can misremember things that happened, and feel like we didn’t do enough. Or we think that something bad happened, and to have that other witness there, or just somebody who can be supportive and say, “Okay, let’s actually talk this through.” Because our brains do some amazing things, and then sometimes they’re not that helpful. We kind of blank out. We’re not really aware of what happened, and then our brain can make up a story of, “Oh, I didn’t do enough,” or, “This wasn’t good enough,” or whatever. So to have that outside, objective observer like an end of life doula, that can help the family reframe that in a way that actually makes sense, or just points out some facts, is huge. You’ve had that experience, knowing that having regrets is a lot to live with, so what a gift that you give to to families. And it doesn’t even have to be in person–they just did it on the phone–it’s just having that person that you had the experience with and has some perspective, has some education, and a broader experience. It helps you find your place, I think, and calm your spirit. You know, it’s such a hard thing to go through. If you could alleviate one niggling doubt or regret that’s hanging around in your head in your heart, why not? Christy: Absolutely. You mentioned the phone, and I’m glad that you did because you all four doulas at Evening Star work anywhere in the world, correct? Christine: We work physically in the broader Portland metro area, although we have done as far as Corvallis. We are absolutely able to do video or phone coaching, which can be very effective because so much of this is conversational, and that coaching piece really can happen in a relaxed way on a phone or a video chat. So yeah, I guess you could say we could go internationally if we could figure out the time zone. Christy: How many times do people usually meet with you, or is there a prescribed period of time, or is it as unique as every individual? Christine: It really is. We’ve had the client in Corvallis who we spent about five hours with, and then post-death we had a two-hour follow-up with the daughter of the fellow who died. I mean, I’ve spent 30 hours working with the woman who was going to stop dialysis. She was deep into her legacy project, which was letter-writing and that was that was an amazing process to watch. It was her way of going back through the chronicles of her life and thinking of all the people she had loved and who had had an impact in her life. She wrote a letter to each one of them saying why she loved them, why she appreciated their friendship, things that they had taught her, and with every letter you could see this physical lightening of her spirit. “Nope. Nope, today we’re gonna do [she says somebody else],” and so she she worked in like a spiral. It was like that hardest letter was in the middle, but she sort of built this muscle memory or this understanding that I am capable, I can do this. I can figure out this process. Okay, I can find a way to say goodbye to my sister, and find a way to leave a message based in love. Primarily, it was a way for her to forgive herself, and for her to be at peace with that relationship. Honestly, at the end of writing that letter, she was ready. The last thing she said to her son-in-law when she was dying was, “I feel so peaceful.” And I’m confident, totally confident, that a lot of that came from the hard work that we did together. That was 30 hours we traveled. To our clients, they don’t need to come to us, and so a lot of people find that helpful. So yeah, we could do it in person not too far away, and otherwise, happy to do video coaching or phone coaching. Christy: I appreciate how personalized that is, and specific to the situation. And certainly in the situation where you’re saying it was five hours, that was like, to me, what I heard out of that story, was like probably the most crucial piece there was, that you said, “Of course you can get in the bed.” That was huge. Then within the 30 hours spent with the client doing the the letter writing, it gave you an opportunity, it sounds like to me, to really deepen that relationship and to build a trust where she was really able to trust in working with you and really feel supported in doing that project, doing that work, and getting to that place of peace. Christine: It is really going to be different amounts of time for every person. Some people are just going to want someone to talk to. Some people are going to work on a legacy project. Some people do want us to sit vigil; other families have a robust enough support network they don’t necessarily need that. So yeah, it’s really hard to say what is normal, but I don’t see any normal pattern. I’m gonna be what the family needs. Sometimes people reach out to us and they want to support their parents. The parents, they don’t understand this concept, or why they would need it. You know, they worry about the money. It’s really important for people to know that we can absolutely support the family that is supporting the person who’s dying. If I can support you, and you in turn will support the person who’s dying, we are still doing our job and we’re still doing good work and we will have changed in a tiny way an understanding of how death can be in this country. And that’s my goal. Christy: I appreciate what you’re saying about the family, because as much as I love working directly with people living with dementia–like, that’s my happy place, hanging out with clients who are living with dementia because the energy exchange is just so awesome– but pretty much the chief function of my job now is really supporting the family care partners and teaching them the skills and techniques that they need in order to best support and assist their person. It’s by proxy but it’s still hugely important because as that close family member, they’re kind of the center of the universe. I mean, they’re really making the magic happen on that day-to-day basis. So they do need support and whatever knowledge they need, too. So that’s amazing, thank you so much for the work you do in the world. How can people contact you, and what if people have questions, just like, “Okay, I think this might be a good idea. I think we might need something like this down the road.” Can they email you questions? Can they ask questions? Christine: Yes, send us a request or your question through the website. Christine: We offer a free half-hour consultation with anyone, although rarely are we able to keep it at half an hour because we want to be a good fit and that’s longer to discern. And so often, for people just to find somebody who will listen to what’s happening–the story gets large. So call us, email us, say you want to talk to us. One of us will call you. We’ll spend some time with you and evaluate with you if we’re a good fit and how we can help. Christy: Christine, thank you so very much. Really appreciate you taking time to talk with us today and for doing the work you do in the world. It’s very important. Thank you.